Advantage Building Systems, L.L.C. 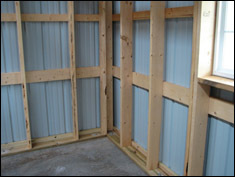 specializes in the quality construction of homes, agricultural buildings, light commercial, and personal storage units. We also offer pre-engineered steel structures. Our company is fully insured. Our crews are fully insured and we even carry builder's risk insurance on the project through completion. Please take time to browse through our Web site and see why our customers are taking "Advantage" of the best service and products available in the industry.